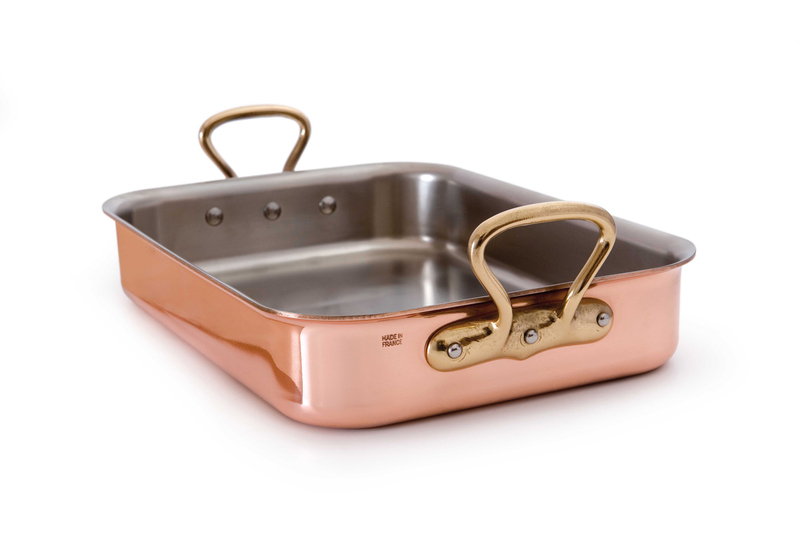 This Mauviel copper large roasting pan is ideal for a good sized roast or a 12 to 15 pounds turkey. This copper roaster has lovely brass handles. The Mauviel roaster measures 15.7 inches long x 12 inches wide x 3.3 inches high. As with all Mauviel copper cookware, this roaster heats and cools quickly so you have great control while cooking. You'll love the precise heat control and responsiveness of Mauviel copper cookware. It heats extremely quickly because copper conducts heat twice as fast as aluminum. It's 10 times faster than stainless! Copper cookware also cools quickly. When you turn off the heat, no need to worry about food cooking longer than you planned.